Garry and Anita met at LeTourneau University. Garry, who grew up in southern Florida, dedicated his life to mission service while in high school. Anita was raised in Illinois and Ohio, where her father pastored several churches. She accepted the Lord when she was seven and as a teen, felt God calling her to serve in missions. 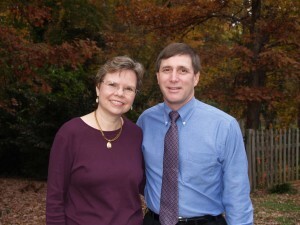 From 1982 to 2001, Garry and Anita served in a cooperative agreement with Lumiere Medical Ministries in Haiti and then in the LMM home office in North Carolina. In 2001, Garry and Anita accepted a new assignment with Mission to the World (MTW) to serve at the Presbyterian Clinic in Patchakan, Belize as the clinic administrator and nursing manager. They were involved in youth ministry at the Patchakan Church where Garry preached monthly. They helped to improve the evangelism outreach of the clinic by hiring a chaplain to minister to the spiritual needs of the patients. Other responsibilities included coordinating medical visitors and hospitality at the clinic. The Chambers have three adult children.